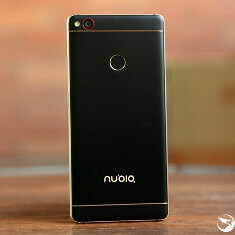 It was back in late June that Nubia, a sub-brand of ZTE, launched its long-awaited Z11 smartphone. With an almost bezel-less, all-metal design, 5.5-inch FHD display and power to match, it quickly sold out its initial inventory. Having then gone back on sale, it sold out yet again shortly thereafter. With the company poised to launch the device Stateside in the near future, an eye-catching Black Gold Edition has been spotted in the wild. Matte black with gold trim along with a few subtle red accents, the Black Gold Edition of Z11 certainly befits the high-end nature of the handset. Apparently, this newer model has just gone on sale in China, and includes the Snapdragon 820, 6 GB RAM and 64 GB of storage space. This is somewhere in between the two pre-existing variants, which are offered with 4 GB RAM and 64 GB ROM for the equivalent of $374, or 6 GB RAM and 128 GB storage ($524). As a reminder, the rear camera is a 16-megapixel effort with OIS and PDAF, while the 8-megapixel selfie camera features a wide-angle lens for group selfie lovers. There's also a fingerprint scanner and 3000 mAh battery with fast-charging capabilities. For 2,999 Yuan ($449), it's priced right in between the two current configurations, which makes sense given that, as aforementioned, you get a bit of both under the hood. It's quite refreshing to see that Nubia hasn't decided to overcharge customers for this alternative variant, particularly gven the immense popularity of the Z11. The firm might easily have stuck another $50 or $100 on top, as some companies like to do when they add new color options. Given that the Nubia Z11 is en route to other parts of the world including the United States, would you like to see the Black Gold version reach a store near you? Take a look at the snaps below, and let us know what you think in the comments. The specs are better than the N7. And looks beauty than the ugly N7,S7,S7E. Best bezeless look to date. This or xperia xa that is. Would only prefer the back to be flatter. This is one seriously good looking phone. Apple You see this is to look nice phone. Apple stupid design. ZTE Axon 7 is better looking than this one. Feel in love with this color combo when Nokia announced the lumia 930 special edition. That was a gorgeous phone. The gold antenna linea and the red accent ruins the simplicity and elegance in this device for me. I felt the same when I saw the black and rose gold version of the Moto Z/ Moto Z Force. The accenting on the camera ring and sides of the phone added more character and thought to myself how much better it would look in copper instead of rose gold. Sadly Verizon only went with lunar gray. More manufacturers should have color options that include accenting. I agree that this phone is for me the best color combination (black and gold) to date, and to add as one of the sexiest in the market this year. Though sexiness is subjective, but for me this is it. Buying one soon.